Can you believe it's 2016? I can't! The past year flew, and I feel like I'm scrambling to get new goals and ideas down on paper before this one is too far along! Resolutions have never really been my thing, but in the last few years I have been more diligent about goal making and implementing. My love of lists comes in handy this time of year...other than when I have toooo many lists. I'm currently reading "Make it Happen" by Lara Casey, which has been challenging me to really think about my goals and purpose in my life. I'm only halfway, so I'm hopeful for some direction by the end, but either way, it has been helpful to really reflect on the past year and where my life seems to be heading. It's funny looking at goal lists from a couple of years ago and seeing what I thought I'd be doing or already accomplish by this time. Yep, not realistic for the most part! Or priorities have changed. A small example was the goal to have replaced aging vehicles by now, and then they keep on running, and you begin to think, heck, I'm going to drive this until the wheels fall off! For the past few years I've made long term and short term goals based on categories like family, finances, career, artistic, faith, pleasure, education, physical, and I'm newly adding a prayer category. It sounds like a lot, but it helps for me to categorize like this. Most overlap in different ways anyhow. I have certain career goals and financial goals for saving that play into family goals like owning a home in the near future. An artistic goal is to just make and create more freely and working on my pen and ink drawing skills in particular. 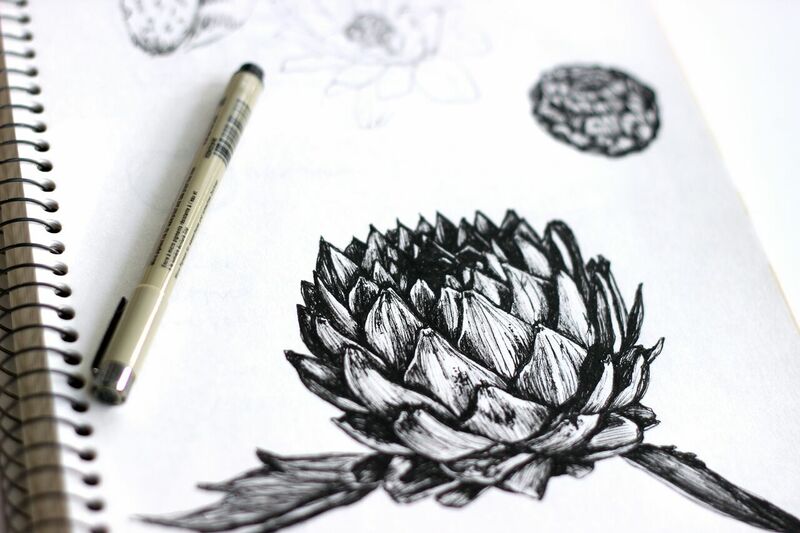 This artichoke is one of my favorite sketches from the fall. So that's what I'm working on so far in this new year, and I look forward to sharing new work and works in progress soon! Happy New Year! Looking for a unique, personalized gift for the special people in your life this Christmas? 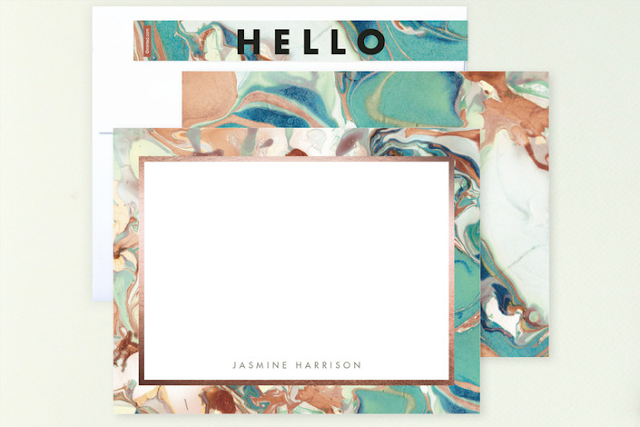 I have two brand new stationery designs now available at Minted! The first is called "Marbled Border," and it has real gold foil! 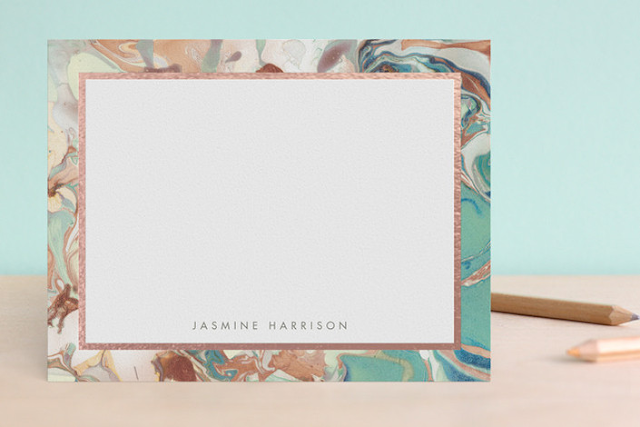 Not only are three different colors available, but you can even choose between gold, silver and, dare I say, rose gold...ooooh...The marbling in the design was created by using nail polish and water! 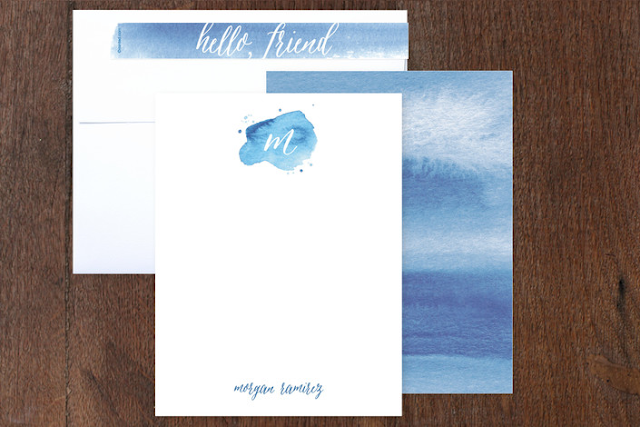 The second new stationery design features my own watercolor splashes and textures and is aptly called "Watercolor Mark." This design is great for budding artists or for any color-loving, art-admiring person. 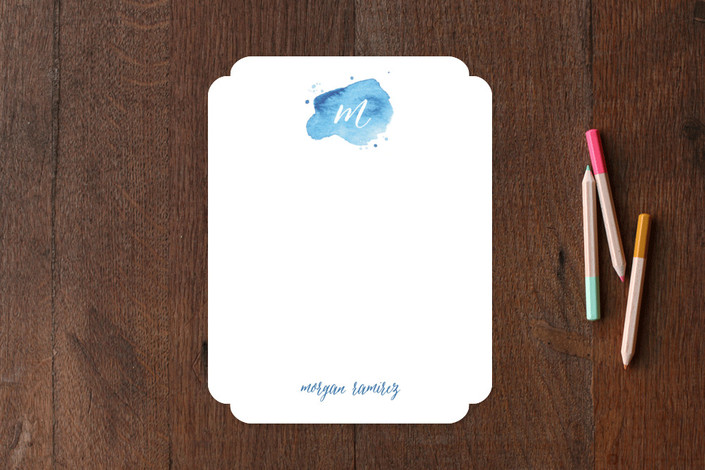 Personalized stationery is handy for letters, thank you notes or for leave behinds. Letter writing is just plain classy. 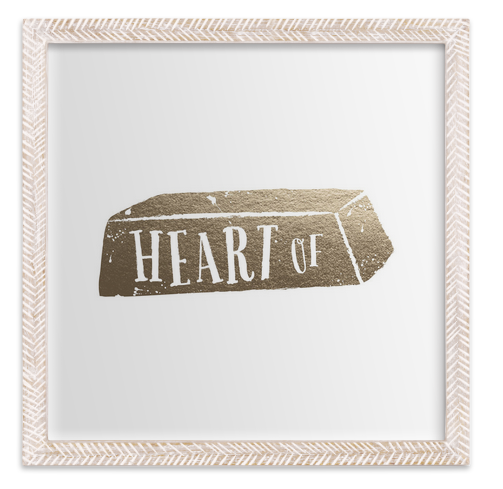 To check out these designs and more, head to my Minted shop. Marbled Border show with rose gold foil in the color "Marble." Watercolor Mark in the color "Ocean." 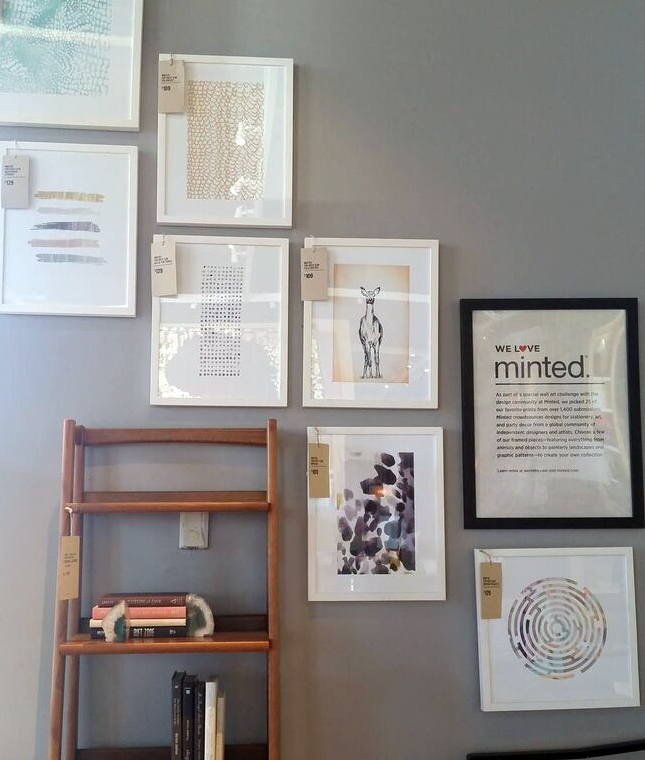 My "Field Sketch" art print has recently been spotted on the walls of the San Diego West Elm! I love seeing this from the other side of the country! As always, it is in good company alongside several other beautiful Minted art prints. I hope this finds a happy home on the west coast! After a crazy spring full of holiday designing, results are finally being revealed! I'm excited to announce that I have three new holiday designs available in minted's new collection. 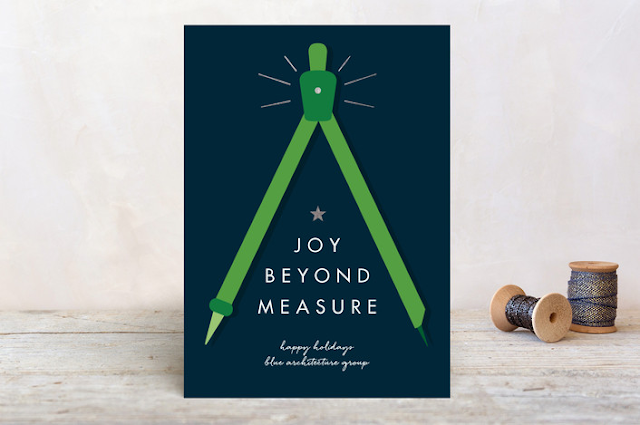 All are in the corporate holiday card category, which is new for me! 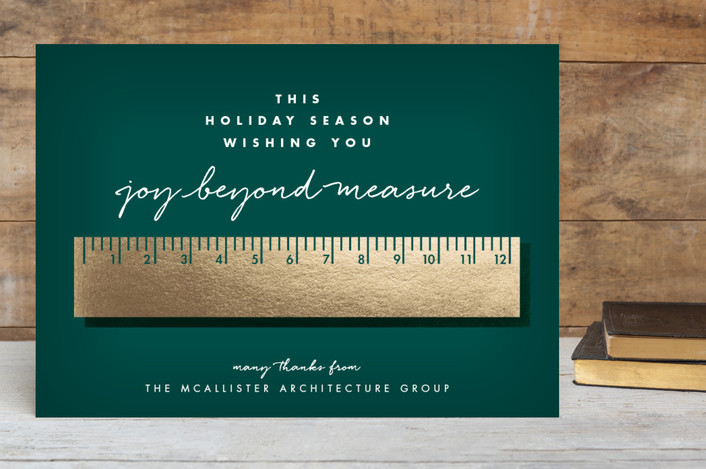 The first is Joy Beyond Measure: A minimal and modern design with a bold, gold straight edge. 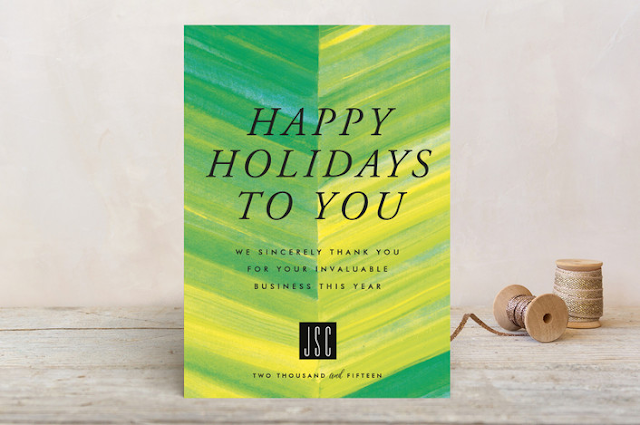 This card features faux gold foil and would be perfect for art, design, or architecture studios. The second design is Joy Encompassed: A tongue-in-cheek graphic and illustrative design featuring a tree-inspired compass. Can you see the "joy beyond measure" theme I ran with? The final editor's pick is a bold and modern design called Chic Chevron. This design was created for the vibrant business that wants to stand out from the crowd, while being on trend. Each design has additional colorways, envelope options and customizable address labels. See more here! 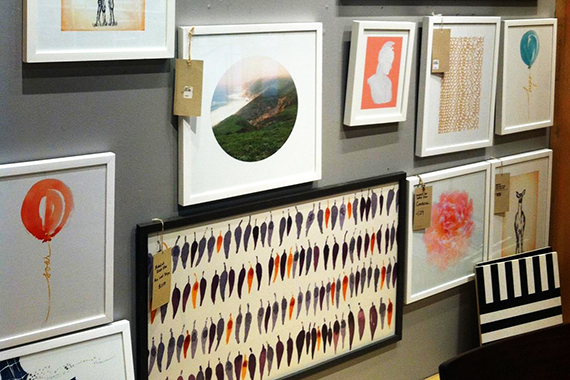 I've recently spotted my "Field Sketch" art print on the walls of the West Elm in Dallas, Texas! Two of them, as a matter of fact! Not in person, unfortunately, but captured along with some other amazing work. It's exciting to see my work clear across the country! Check out the original post here. This photo was taken by Kenda Allen Sims and edited by Monica Cheng. What?! Another special award! My Valentine art print (though I could argue that this is good anytime of the year) "Gold Standard" was recently picked for the "Out of the (Candy) Box" award for the most creative and innovative take on a Valentine's art print. How much more exciting is it when someone else just gets your crazy sense of humor? Not too shabby for an idea I rushed to design before the end of the challenge! You can see all of the winners here.